(Army Release) – About 18 Army Reserve soldiers who served with the 321st Engineer when Ithe unit deployed to Iraq in 2006, and returned in September 2007 will receive Welcome Home Warrior Citizen awards Saturday, March 2 at 10 a.m. Allen Reserve Center, Fort Lewis, Wash. The 321st Eng. Bn.’s mission in Iraq was route clearance in Al Anbar province, to include Ar Ramadi and Ar Fallujah. The 321st Eng. Bn. was part of Task Force Pathfinder, commanded by the 321st’s Colonel Michael Hoxie. The unit returned to the United States with 102 Purple Heart recipients, and 104 Bronze Star recipients. Sixteen of the Bronze Stars were for valor. The unit cleared more than 1,000 Improvised Explosive Devices (IEDs), cleared approximately 100,000 kilometers of roadway and managed the construction of four combat bridges. The insurgency attempted to destroy several highway bridges and the construction of these combat bridges provided coalition forces and local Iraqis the uninterrupted use of road networks. The local economy was restarted when the insurgents were denied safe haven in and around the cities. As Task Force Pathfinder cleared the way for coalition forces to move in and set up neighborhood joint security stations local Iraqi police gained the trust of citizens. The soldiers who cleared the IEDs worked in the mine-removal vehicles RG-31s, Huskys, Buffalos and Cougars. The Task Force lost six soldiers during its deployment: one from Washington, three from Idaho, one from Nevada, one from Wisconsin. Many others returned with injuries resulting from IED blasts, sniper attacks, and various other encounters with the enemy. Through the tireless efforts of the Soldiers of the 321st EN BN the citizens of Ramadi, Fallujah, and other cities in west Iraq enjoyed a dramatic increase in community security and their quality of life. The Welcome Home Warrior Citizen Award was developed to provide an appropriate ceremony in which to thank each soldier who participated in Operation Enduring Freedom and Operation Iraqi Freedom. During the ceremony, each soldier will be presented an encased American flag, a specially designed commemorative coin, a lapel pin set for the soldier and spouse, and a “Welcome Home Warrior-Citizen” flag. The award was established in December 2004 by Lt. Gen. James Helmly, Chief, Army Reserve. Sgt. Angela Mathern and her bomb-sniffing dog Vinny, both of the 51st Military Police Detachment, based out of Ft. Lewis, Wash., walk through traffic in downtown Mosul during a search of random vehicles for weapons and bomb-making materials, Feb. 14. MOSUL, Iraq— U.S. military police in northern Iraq are developing new tactics in an attempt to counter insurgent violence in the Ninewah provincial capital city of Mosul. 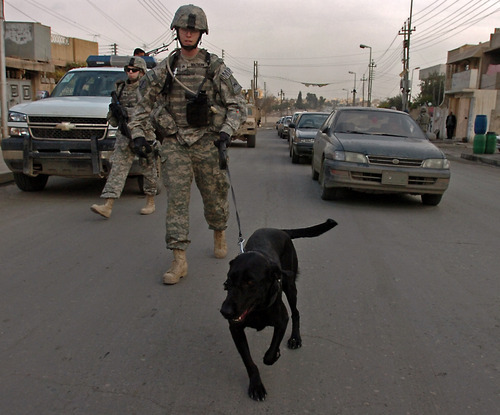 In February, the 552nd Military Police Company, based out of Schofield Barracks, Hawaii, working with military canine handlers, began conducting a series of random traffic searches in downtown Mosul for vehicles transporting explosives. “If we get detection dogs and start actively seeking them out, it denies the enemy the capability of bringing them out,” said Sgt. 1st Class Michael Ford, platoon sergeant for 1st Platoon, speaking of the explosive materials often used by insurgents to create improvised bombs in houses and roadways. On Jan. 24, the issue was brought to a head when an estimated 20,000 tons of insurgent explosives detonated in a three-story building in downtown Mosul, resulting in death and injury to multiple Iraqi civilians. “The goal here is to deny the enemy that availability of supplies,” said Ford, now on his third combat deployment to the city of Mosul. On a recent outing, Sgt. Angela Mathern, a canine handler with the 501st Military Police Detachment, based out of Fort Lewis, Wash., accompanied Vinnie, an explosives dog, in his search of vehicles at downtown intersections. Both Mathern and Ford said the searches are just another way coalition troops are working to bring security to the city of around 1.7 million residents. “This is just something else we can do to help out in our area,” Ford said. Army Pfc. Richard D. Antonishek, son of Rick Antonishek of Yucaipa and Susan C. Mason of Devore Heights, was a member of the U.S. Army support staff who helped coordinate and plan the All-American Bowl high school all-star football game played at the Alamodome in San Antonio, Texas, on Jan. 5. The nationally televised bowl game was sponsored by the U.S. Army and pitted the top high school football athletes in the nation against each other in an East vs. West contest. This was the eighth year that the Army has sponsored the game. In this year's match-up, the East team managed to outscore the West team, 33,-23. Antonishek, a fire support specialist, is assigned to the 2nd Battalion, 1st Infantry, 2nd Infantry Division at Fort Lewis, Tacoma, Wash. He has served in the military for more than one year. 22-year-old Army specialist Kevin Mowl was surrounded family at the Naval Medical Center in Maryland, when he passed away Monday morning. Mowl, a Pittsford native suffered a devastating head injury when a bomb exploded near his humvee in Iraq last August. In November 2004, Kevin proudly graduated from basic training and committed the next four years to serving and protecting our country. Kevin packed his bags and joined his unit at Fort Lewis, WA. Since his deployment to Iraq in June 2006, Kevin has been patrolling with the Alpha Company, 2nd Batallion, 3rd Infantry Regiment, 3rd Stryker Brigade Combat Team. Kevin has held various positions including stryker driver, SAW gunner and radio telephone operator. It's been about a year since the horrible conditions at the Army Medical hospital Walter Reed were uncovered. Since then the Army has cleaned-up its act and its care. Including Fort Lewis which has a new facility to care for injured soldiers. 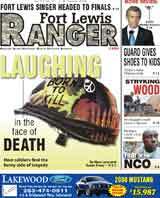 There are 172 soldiers recovering in the "Warriors in Transition" barracks on Fort Lewis. Sergeant Vance Combs survived an I-E-D attack in Iraq and suffers from a traumatic brain injury, "it's quite a long process, everything from trying to adjust to the pain, the constant migraines, going through rehabilitation, neurologists, several doctors, it's just a very, very slow process." But at the Fort Lewis center, Sgt Combs has a clean room, instant access to computers, a rec-room and scheduling for appointments and any other need he might have. Touring the facility on Wednesday Congressman Adam Smith told 710 KIRO "I'm very impressed with what I saw today, (the Army) really did respond to the challenges to what we heard coming out of Walter Reed." Every team that I have gone out for I have always had to push harder, stay longer at practice and convince myself that I was worthy enough to put on the uniform and entertain those who come to watch. That mentality came sadly when I failed to make the elementary basketball team. I remember telling myself, “If I just would have made that shot or got back on defense fast enough I would be out there with my friends.” A year went by, and during that year I erased myself from just about everyone and started to train. I would find myself shooting hoops in every condition possible — pouring rain, blistering heat and, worst of all, Santa Ana winds. I would spend time running doing suicides until I was so tired I would throw up or fall flat on my face. Why did I do that to myself, you ask. Because I never wanted to fail at making another team and being embarrassed in front of my peers. Well, as the story goes, when I made my way to junior high school and tryouts came I was ready for it. At least, that’s what I thought. In my mind I was better than everyone out there, but good stories are only for the movies. I failed miserably, but I made it to the third day of tryouts. I remember that day like it was yesterday. I walked in the gym, and in the distance I saw a group of young boys looking at the paper. Some of them were giving each other high-fives while others walked away with their heads down as if they just had been rejected from the girl of their dreams. I made my way across the gym, and I stopped in my tracks. I knew deep down that I hadn’t performed well enough to make the team. I never made my way over to the board; I turned around and walked out the door. That same day I walked over to the track, put down my bags, laced up my shoes, tucked in my shirt, and stepped up on the track. I could feel the dirt of the track through my cheap shoes. I closed my eyes and took in a deep breath. I went somewhere so deep, so far I can’t even explain it, but that was where I was supposed to be. I ran that track for two hours and didn’t remember one minute of it. I close my eyes and picture what I am about to do. The snow is falling hard landing on my head and on my eyebrows, making me look like an old, gray man. The roads are slippery and wet, but I must contend with the conditions so that when they do happen during a race it will be like running with the sun up. This morning I was running with my squad leader, Staff Sgt. Rine. He is getting ready to qualify for Special Operations, so his training matched mine. I have been blessed to have a squad leader who allows me to train on my own. Having someone trust me to do the right thing makes me work harder. The run started, and as we made our way down the road I realized quickly that it was just he and I. As we crushed our way through the snow, pumping our arms like a train, I felt reborn. There’s something about running that makes me feel like a kid again. My heart was beating; my legs were moving smoothly. At the 3-mile mark we turned around. While on our way back, I noticed more men making the tricky run up the road. As we ran, I took in the sites and sounds. A squad leader on the side of his formation was yelling at the top of his lungs, “You better not stop; it snows in Iraq.” I laughed, but he was being honest; I have played in it. The next group we ran by was a group of guys who couldn’t seem to keep on their feet. They were falling everywhere. As we made our way back to the finish, I took a minute to think about life in general. To me that run was easy; I kept focused; I knew that road — every pothole, every uneven spot. The snow covered it, but I could see the ground like the snow wasn’t there. Everyone travels a different path in life, and through our experiences — some good and some bad — we learn what works for us. And for me, all I have to do is remember the first day I looked in the mirror and saw myself. I was wearing my school sports uniform, and instead of wearing the one uniform I had trained so hard for, I was wearing the one I had least expected — the junior high running jersey. The Fort Lewis Army 10-Miler team practices have started, and so far I have found myself working extra hard and spending extra time at the gym. I also have been running in every condition you can think of; old habits die hard. The one thing that I have had to face so far is trying to take my half marathon mentality and place it into the 10-mile mentality. For me that can be hard. So far the team consists of six to seven guys and a handful of women. The first run of the season was a nice 6-mile run just to get things going. I matched up with the other guys running, and we made our way out. As we started, we talked a little about experience and what we have done; it’s a runner thing. I found out quickly that not everyone spends their weekends running in races. The one thing I noticed is the men I run with have natural talent and all they need is to be coached. I am sure they will get it here. As the week went on, more men showed up, and the talent started to get better. In my mind I am drawn to it, so I love it. Every practice is different, and I seem to be getting better and am learning how to feed off of other people. I finally manned up and went out to find a 10-mile race. After some time, I found the Valentine Marathon and 10-miler. So my wife and I went down to Olympia and checked it out. My wife doesn’t run, but she is a great supporter. She thinks I am crazy for running, and I tell her that she is crazy for waking up this early to come with me. The night before the race I drove the course and started making my notes. I am all about being prepared; I even take video. I wanted to know every inch of that road. So I went back to the hotel and started to watch the video, and after an hour I came up with my plan. My wife huffed in the background and mumbled, “Are you serious? You better win this thing.” I looked at her and smiled and said sarcastically, “Oh, honey, anything for you.” I turned around and laughed. The next day I lined up at the starting line, and the only thing I could think was “I wonder what it feels like to give it all you got.” The lady came over the speaker: “OK, Five, four … .” Just for a moment I closed my eyes, and I pictured myself standing in the middle of the gym and making up my mind what I wanted to do. I then quickly envisioned myself on the track running around, and then I envisioned myself running in the snow huffing and puffing. The lady’s voice echoed in my head and then disappeared. The race started, and for the life of me I couldn’t even tell you one thing about it — except that when I came across the finish line I was the first one. I ran 10 miles in 1:09:22. OK, it’s not fast, but hey, it’s a win, and I have confidence now. The ten-miler season is a long one, and I know that I still have to make it. So this little run has given me encouragement to get to where I am supposed to be. For those of you who are interested in the backstory of the junior high thing, I never found out if I made the team. But the next year I made my way across that gym, and there I saw on the top of the list my name and a message next to it from the coach. “Hardt, are you going to come to the first team practice this year?” I laughed and turned around and smiled. I made the team, not just that year but the year before as well. I am glad I turned around that year, because to this day I work so much harder at what I do to succeed. A ceremony for the 120-member unit will take place today on the Army post.The 42nd Military Police Brigade will provide detainee operations in Iraq. The unit also was deployed to Iraq in November 2004. Another military police brigade from Fort Lewis soon will be deployed to Iraq.Another military police unit just returned from duty in the war in Iraq.